MALAYSIAN BLOGGERS: "This happened because of you. Thank you,"
"This happened because of you. 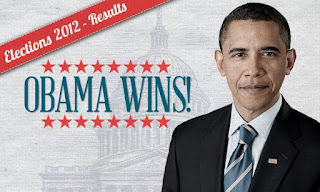 Thank you,"
WASHINGTON (AFP) - US President Barack Obama swept to re-election on Tuesday, creating history again by defying the undertow of a slow economic recovery and high unemployment to beat Republican foe Mitt Romney. Mr Obama became only the second Democrat to win a second four-year White House term since World War II, when television networks projected he would win the bellwether state of Ohio where he had staged a pitched battle with Mr Romney. "This happened because of you. Thank you," Mr Obama tweeted to his 22 million followers on Twitter as a flurry of states, including Iowa, which nurtured his unlikely White House dreams suddenly tipped into his column. With a clutch of swing states, including Florida and Virginia still to be declared, Mr Obama already had 275 electoral votes, more than the 270 needed for the White House and looked set for a comfortable victory.